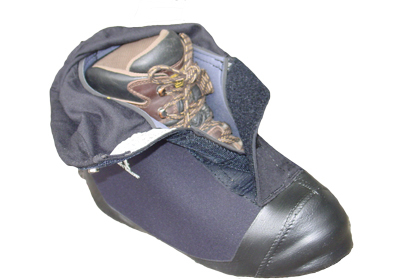 A “shorty” style insulated boot cover style that is designed to work in co-operation with an independent gaiter. Great for use in situations such as mixed terrain climbing where you might want to be able to take the it on and off easily. Please see below for more details. 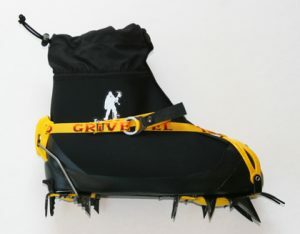 Fits over both “single” or “double shelled” mountaineering boots. Also fits over hunting and backpacking boots. Short height and compact design. For use with an independent gaiter. The Forty Below® Penguins™ model overboot is a “shorty” style insulated boot cover style that is designed to work in co-operation with an independent gaiter. Great for use in situations such as mixed terrain climbing where you might want to be able to take the it on and off, and also in situations such as while belaying to help keep your feet warm. 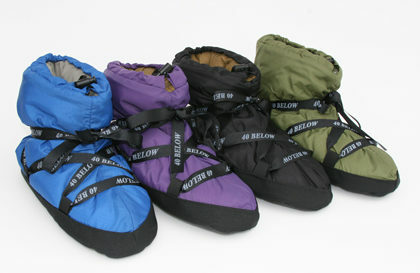 Because of the design and stretchy material they are easy to put on in the cold, and are compact in your pack. Use Forty Below® Penguins™ overboots with a separate set of gaiters, or gaiters on the pants or bibs you have, plus they are well suited for use over the top of supergaiters with rubber rands. 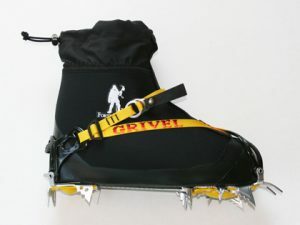 A very compact style of overboot, it is built similarly to our K2 Superlight* model, except that it has a short 3″ tall gaiter, and does not have a crampon patch to help reduce weight and bulk. The Forty Below® Penguins ™ overboot uses a special nylon covered, 4.7 mm stretchy closed cell neoprene foam insulation, with 2 layers of heat reflecting Titanium. This insulation goes from about the top of your climbing boot, completely around and under the boot, with no gaps in the insulation. The insulation panels are glued together, and stitched on the inside and outside surface, with no sewn through seams. They fit trim to the boot, and are not bulky. Because of the stretchy insulation material they are easy to put on in the cold, and they roll up small in your pack. 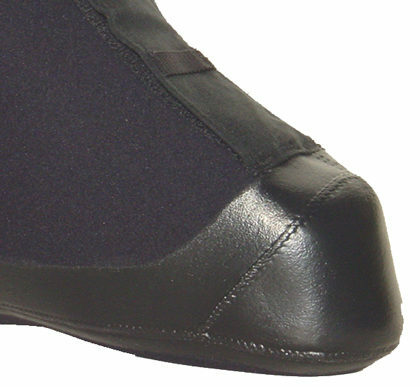 The toe and heel area have small triangular shape panels made of a slightly thinner neoprene insulation that allows for many wire toe bails and flip lever heels to simply compress the insulation and rest on the toe and heel groove of the boot. The toe, heel, and lower side area of the overboots have a thin rubber paint applied to add abrasion resistance and help protect the stitching. 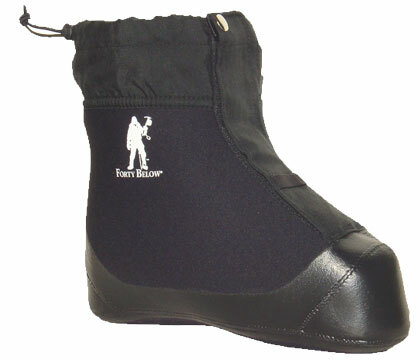 A 2” wide heavy duty velcro front closure goes all the way down to the toes allows for easy adjustment of bootlaces and includes a webbing gaiter hook loop sewn on near toe. 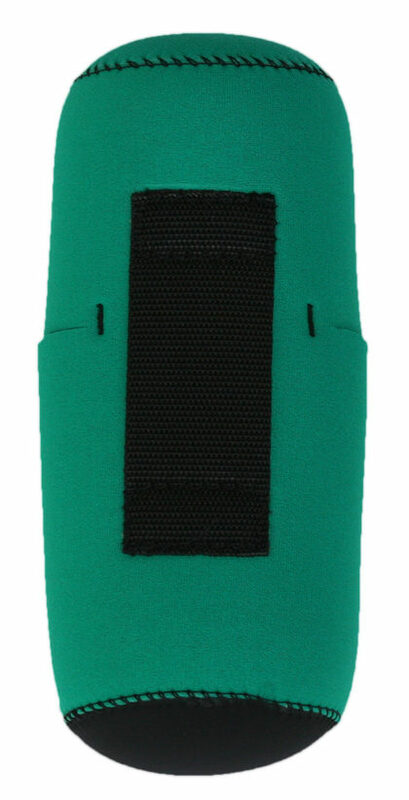 The 3 inch short gaiter is made of a non-coated, windproof and breathable Cordura nylon to help minimize frost build up. Elastic drawcord top closure, with a cordlock on top of the gaiter. Wire toe bail/flip lever heel. One of the great features of Forty Below® overboots is that they are easy to repair! 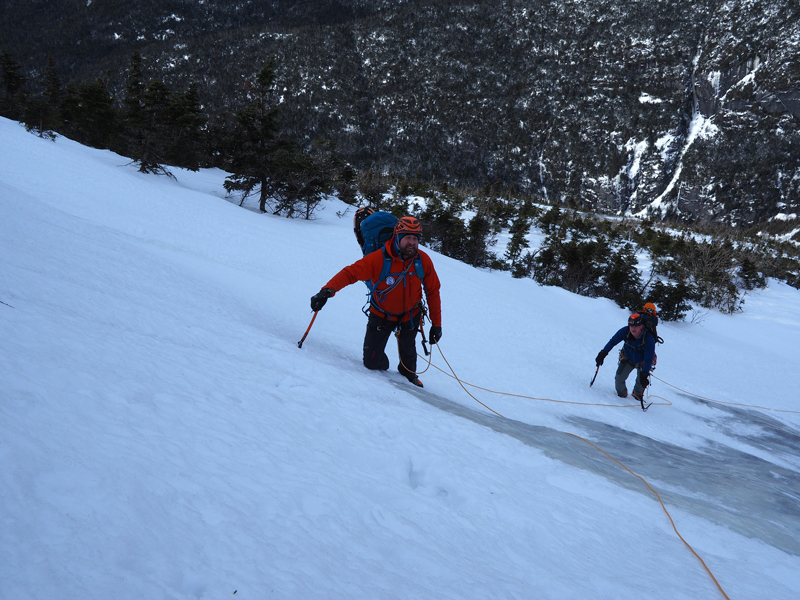 This is especially helpful, as crampons and rugged terrain are so hard on everything they come in contact with. 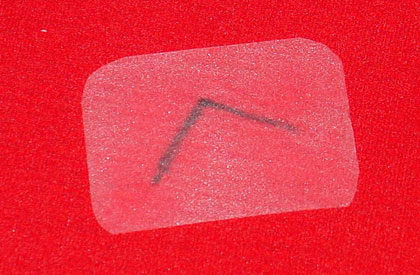 Repairing is easily done by simply gluing the poke holes together, using glues such as those for repairing neoprene fishing waders, wetsuits, like AquaSeal from McNett, etc. For the fabric gaiter repairs, the iron-on style fabric patches work well and are really easy to put on, and can in many cases eliminate the need to sew patches on. 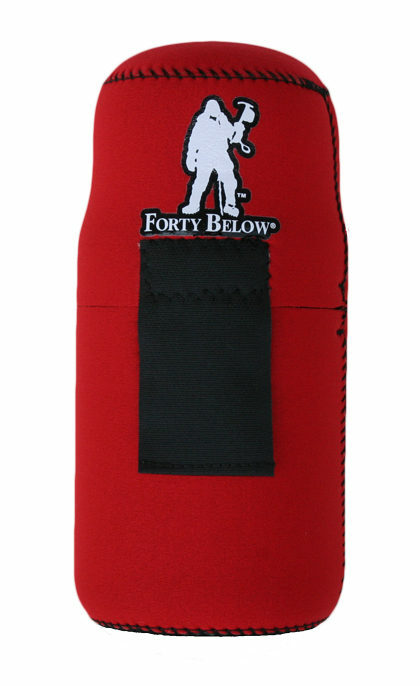 The Forty Below® Repair Patches, which are a special sticky and stretchy tape that works great for repairs during a trip (one is included with the overboot). ORDERING: We will select the proper size for your boots from the information you provide us in the ordering fill-in boxes above. SIZING: XS-XXL To fit from ladies 4 to mens 16. 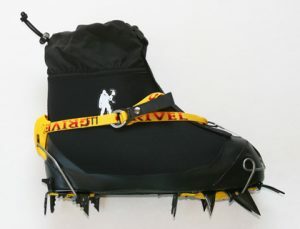 Can be fit over a single or double shelled mountaineering boots. 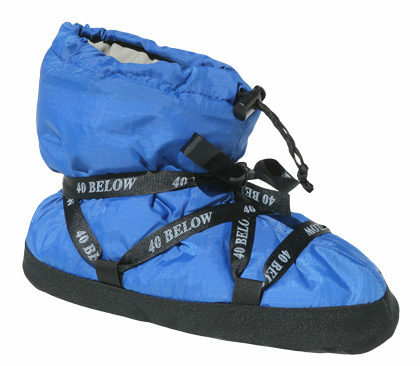 OVERBOOT SIZING: Forty Below® Overboots are made with stretchy insulation materials, and have a wide range of different sizes and shapes of boots that a particular overboot model/size can fit. Because of this wide range, we ask that you provide some basic information about your boot and crampon, and then we will select the proper size with that information for you. WEIGHT: 1lb 3 oz. (532g) per pair size Medium.